Horse chestnut is a medium-sized tree in the soapberry family that is native to the Balkans and later introduced to Europe in the mid-16th century. Because English children utilized horse chestnuts in a game called conkers, the tree is sometimes called the conker tree . Like its close relative, the Ohio buckeye, horse chestnut produces nuts that are toxic to some animals, especially horses. Similarly, even though the bark and fruit are traditionally used to make infusions and tonics, modern use of this herb is generally limited to topical applications. Aesculus hippocastanum, a member of the Sapindaceae family, grows to 36 metres (118 ft) tall, with a domed crown of stout branches; on old trees the outer branches often pendulous with curled-up tips. The leaves are opposite and palmately compound, with 5–7 leaflets; each leaflet is 13–30 cm long, making the whole leaf up to 60 cm across, with a 7–20 cm petiole. The leaf scars left on twigs after the leaves have fallen have a distinctive horseshoe shape, complete with seven "nails". When tree flowers in spring the flowers are usually white with a small red spot. The are produced in erect panicles 10–30 cm tall with about 20–50 flowers on each panicle. Usually only 1–5 fruit develop on each panicle. 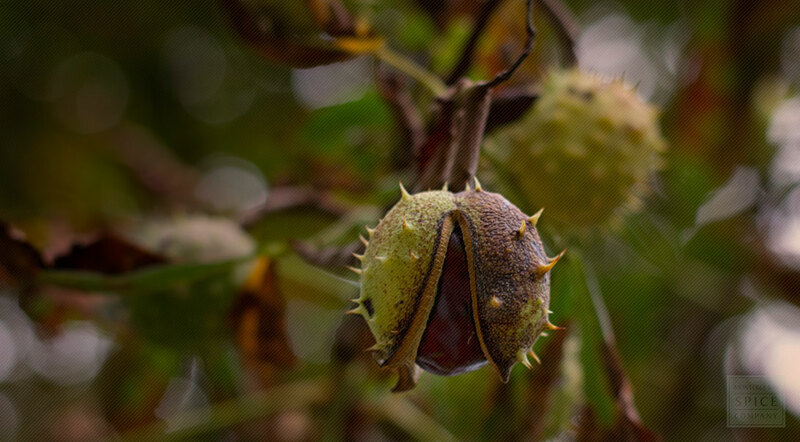 The shell is a green and spiky capsule and it contains one (or more rarely two or three) nut-like seeds called conkers or horse chestnuts. Each conker can grow in diameter from approximately 2 to 4cm (roughly the size of a golf ball) and is a glossy nut-brown with a whitish scar at its base. The common name Conker Treeresults from the popular children's game "conkers", played in Britain and Ireland, wherein the nuts are drilled and hung from string to be struck against each other. 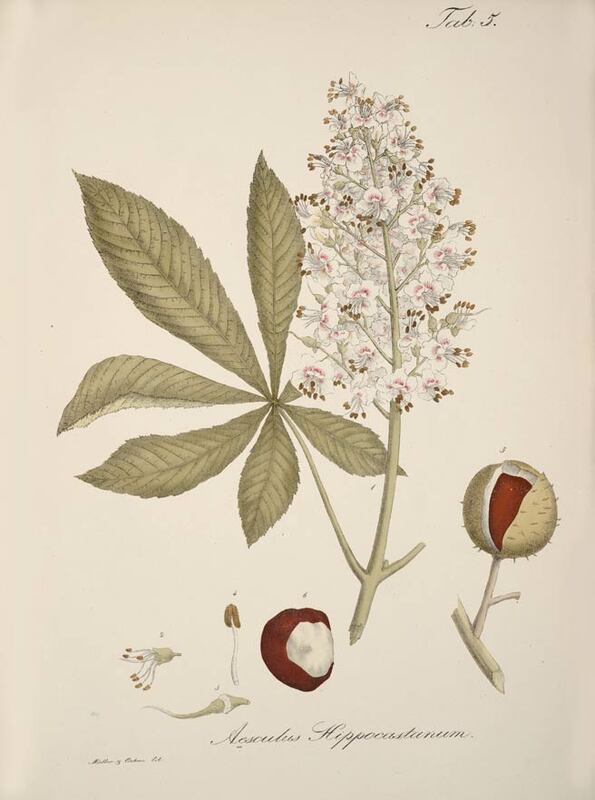 The common name "horse chestnut" is reported as having originated from the erroneous belief that the tree was a kind of chestnut (though in fact only distantly related), combined with the observation that eating the fruit cured horses of chest complaints. This assertion is most likely apocryphal as this plant is poisonous to horses. Aesculus hippocastanum is native to a small area in the Pindus Mountains mixed forests and Balkan mixed forests of South East Europe. It is widely cultivated throughout the temperate world. Grows commonly in mountain woodlands, used as an ornamental tree in populated areas. Horse chestnut prefers to grow in a deep loamy well-drained soil but is not too fussy tolerating poorer drier soils. Sow seed outdoors or in a cold frame as soon as it is ripe. The seed germinates almost immediately and care must be taken in providing protection from severe weather. The seed has a very limited viability and must not be allowed to dry out. Stored seed should be soaked for 24 hours prior to sowing and even after this may still not be viable. It is best to sow the seed with its 'scar' downwards. If sowing the seed in a cold frame, pot up the seedlings in early spring and plant them out into their permanent locations in the summer. The prickly green seed pods are harvested in autumn and are split open to reveal large, shiny seeds. They can then be dried for later use. Store horse chestnuts in an airtight container in a cool, dry place.